The Athens “First Cemetery” (Protonekrotafio) is one of Athens’ best kept secrets. Don’t confuse it with the Ancient Cemetery at Keramikos, which incidentally was also one of Athens best kept archeological secrets until very recently. Understandably a place of human sorrow, it is also provides, though, a fascinating window into the history of Greece from the nineteenth century through to the present day. Among the thousands of graves, there are hundreds of Greece’s foremost politicians, military leaders, revolutionaries, benefactors, academics, tycoons, artists, actors and actresses, and churchmen –many of them household names. Even more importantly the cemetery is the country’s largest repository of sculpture, as the funerary monuments date back to the 1830’s. The cemetery is truly a sculptural garden through which the various artistic currents present in Greece can be appreciated, from the temple-like tomb of Heinrich Schliemann (designed by Ernst Ziller, who is also buried in the Athens First Cemetery) to the most recent, “modern” monuments, including the grave of actress and former Minister of Culture Melina Mercouri, whose tomb is often sought out by Athenians and tourists in the know. The cemetery has two Greek orthodox churches, as well as a Catholic church, but it also a Jewish section and a Protestant section. 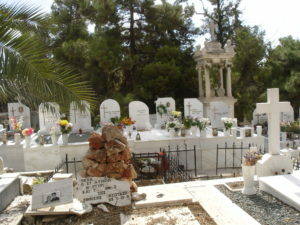 While the majority of those buried in the Protonekrotafi are Greeks, the cemetery is also the final resting place for a number of PhilHelenes, such as actor and director Jules Dassin, author TH White and filmaker Humprey Jennings. Protonekrotafio, Athens’ “First Cemetery,” which is also something of an oasis in the midst of the virbrant, bustling and sometime chaotic city, rates with the famous Highgate (London) and Père Lachaise (Paris) cemeteries, and definitely rewards the visitor who takes the time to stroll through it’s vast graveyards. The Athens First Protonekrotafio Cemetery is located in the Mets area of Pagrati, about a 15 minute walk from Syntagma Square, behind the Old Olympic Stadium and the Temple of Zeus. 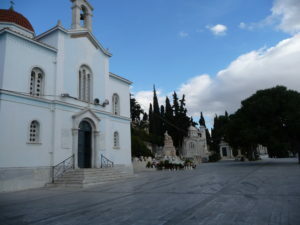 The main entrance is at the top end of Anapafseos Street (Eternal Rest Street), but if you are coming from Ymittou Street in Pagrati you’ll find a closer entrance on Markos Mouskourou street.